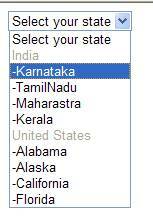 The above jQuery code will disable all the list items that have Country as value and thus making it non selectable. Do you have a working code that can be used by anyone? Submit it here. It may help someone in the community!! How to search a folder or file under a directory using wildcard in C#? How to split string using C#? www.codedigest.com. All articles are posted "AS IS" with no warranties. All articles are posted for educational purpose only and individual authors are responsible for their article. Please mail admin@codedigest.com for any queries or compliants.